There are many reasons why you may consider to change or remove your name from a PowerPoint presentation or Microsoft Office document (also applies to Word and Excel). Privacy is one of the most claimed reasons. Author name, subject, keywords, presentation title, creation date, etc. help to identify the document’s topic or content and it is known as metadata information. In PowerPoint you can easily change the Author Name of a presentation and here we will explain how-to do it. 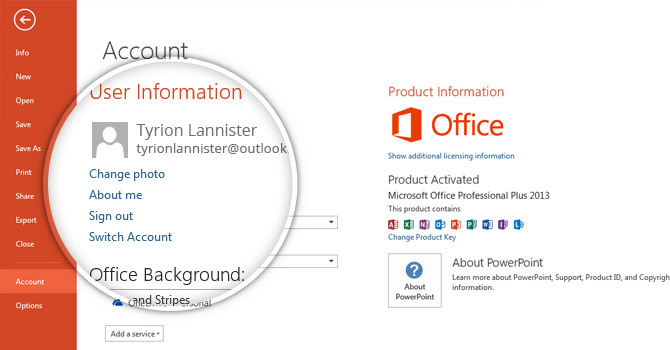 Some properties are updated automatically every time you open or edit a PowerPoint document. In PowerPoint 2013 you can view the meta data information clicking File menu in the PowerPoint Ribbon and then clicking Info option. Here you can see the properties pane at the right. Under properties pane there is an entry for related people who worked in a PowerPoint document. The common properties here are Manager, Author name and Last Modified By field. For privacy reasons you may want to hide the presentation author name or last modified by field. For example, if you are sharing a PowerPoint presentation online and other people can download the presentation from the Internet. 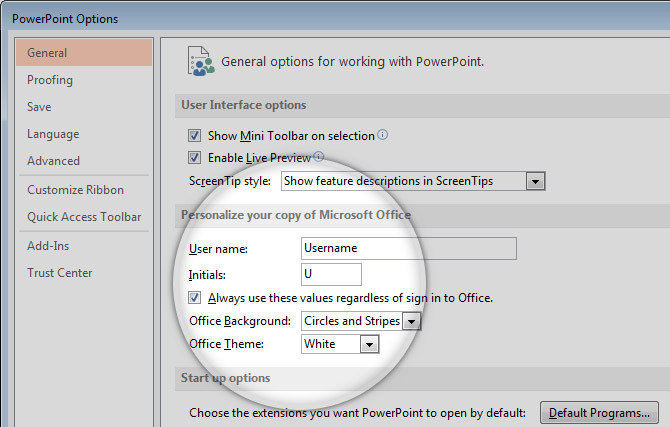 In order to change the Author Name of a presentation in PowerPoint 2013, go to File -> Account. 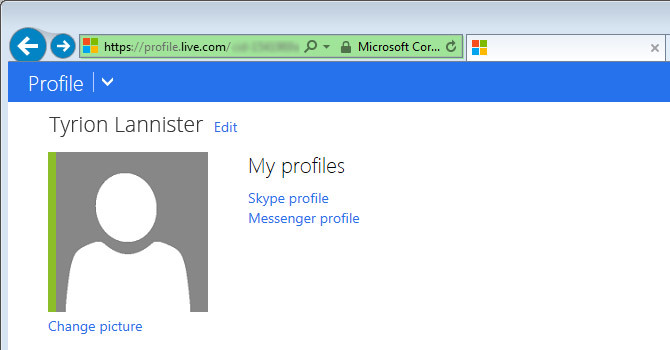 Having Account page opened in PowerPoint, look for About me link under User Information section. By clicking About me link, you will be redirected to the Profile page (it will open the Web Browser) in order you can Edit your profile online. If you are not signed in then you’d need to enter your credentials. You can override your account user name and setup PowerPoint to use another User name as Author name. Go to File -> Options and here you can configure and personalize the the copy of Microsoft Office. In this configuration dialog box you can change the Username and Initials that are often used for tagging your Office documents. 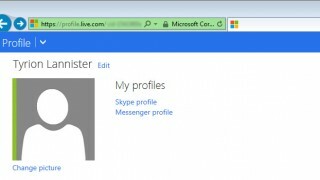 If you check “Always use these values regardless of sign in to Office” then your User name will be used instead of your profile name under Microsoft account. This can be useful if you don’t want to link your Microsoft Office account to the same name that was configured in the desktop installation of Microsoft Office.